Orders for heavy duty Class 8 trucks tumbled 43% Y/Y (down 24% M/M) in December to just 21,300 units, representing the second consecutive YoY decline in 2018 and a 25-month low on a seasonally adjusted basis, according to ACT Research. Class 8 trucks are one of the more common heavy trucks on the road, used for transport, logistics and occasionally (some dump trucks) for industrial purposes and their orderbook is used by Wall Street as a coincident indicator of trade and logistical conditions. Typical 18 wheelers on the road are generally all Class 8 vehicles. 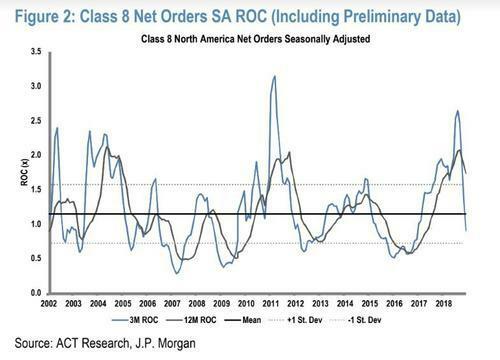 As Buckingham analyst, Neil Frohnapple said, "overall, Class 8 orders were at the lower end of our expected range for the month of December as a further slowdown was anticipated given the extended industry lead-times." Meanwhile, JPM analyst Ann Duignan forecast that "given current industry fundamentals and supply chain issues, we expect production of ~330,000 in 2019 (up 2% YoY)." While December is widely considered to be the highest net order month, due to unexpected Q3 strength that normally isn't associated with the seasonally weak quarter this year and was the result of front-loading orders ahead of a new round of China tariffs, some analysts such as Frohnapple expected a Q4 slowdown: "...we expected the peak-season order period to be relatively weaker," he said. Meanwhile, Class 5-7 truck orders - consisting of medium trucks between 16,000 and 33,000 pounds - were down 5% to 21,500 units. 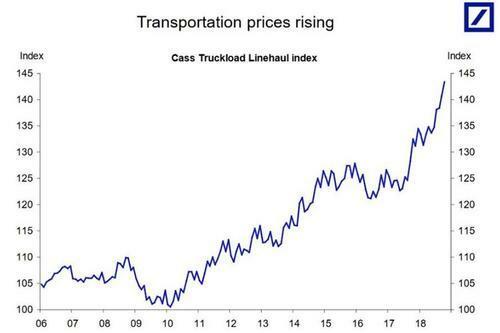 As we pointed out in early December, the exponential surge in transportation prices as a result of an acute scarcity of truck drivers sent trucking prices soaring last year, and led to a historic spike in Class 8 truck orders as supply had scrambled to keep up with demand. That was, until November. 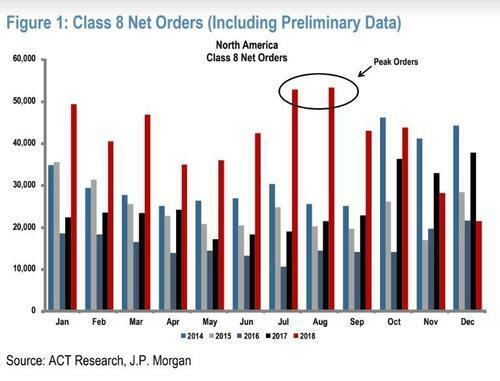 ACT Research reported November preliminary North American Class 8 orders of 27.9K units (26.8K, seasonally adjusted), which was well below most forecasts heading into the release. The total number of orders was down 14.5% from the same month a year ago and off 35.9% from October, when orders reached 43,600. It was the first drop in Class 8 orders this year, falling to the lowest level in 14 months and providing a fresh sign the North American trucking market is cooling down. According to BMO, one of the most important metrics to monitor will be cancellations. And although gross cancellations have risen relatively precipitously, the cancellation rate as a percentage of trailing 12-month orders remains slightly below 10%. 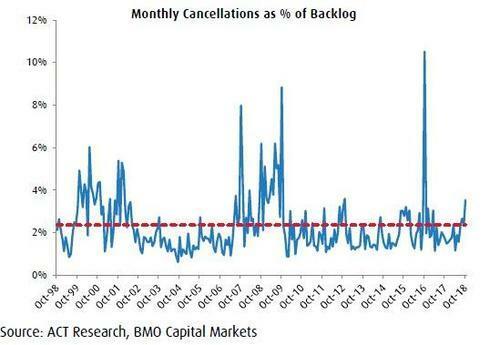 In addition, the cancellation rate as a percent of the backlog reached 3.5% in October 2018, not much higher than the average rate of 2.4%. Watching the sharp downward reversal analysts have grown increasingly sour on the space, and last month UBS analysts downgraded trucking bellwethers Knight-Swift and Werner Enterprises and truck-rail intermodal provider Hub Group on concern over a softening freight market. "The peak season tightening we had anticipated in late October and November has been more muted than we expected", UBS said. The silver linined, according to ACT, is that slowing demand for trucking services and new rigs will enable capacity to stretch to meet demand. "The number of trucks out there in the fleet will start to normalize and return to a balanced state, which is really where things run well." Perhaps this optimistic view is warranted, although a far bigger risk is what happens to end demand for heavy duty trucks if trade between the US and China is indeed about to hit a brick wall. As we noted in December, the latest Chinese trade data was downright ugly, with growth tumbling to the lowest level in over a year, and missing expectations widely, while Chinese imports from the US finally collapsed, dropping 25% in November Y/Y. And while one month ago, we noted that BMO analyst Joel Tiss said that while "there is no doubt that freight and freight-rate growth have slowed, we do not think that it is time to panic just yet" after December's sharp 43% plunge, we ask "how about now?"